The following post is a summary of the downloadable ebook: Who’s the Problem – Me or My Agency? Click on the link if you want to view a detailed analysis of the question along with the top 5 marketing analytics templates to check if your Agency really is the problem. Most marketing teams hire a digital marketing agency to help them build, place, and run paid and organic campaigns. Their typical journey starts off full of promise but, within two to three years, clients typically begin to question the nature of the relationship often asking whether they could find greener pastures by working with someone else. This may happen a lot sooner if you have a bad agency wasting your time and money but it often happens with good agencies. Within the past couple of years, we’ve noticed instances where good agencies get replaced, not because data says they’re doing a bad job, but purely because a client just doesn’t understand what they’re actually doing. So how can you be sure that you’re getting the right results from your agency? What is your level of understanding of digital marketing? Good marketers understand their practice and work in partnership with their agency as a result. Are your foundations set up correctly? Success is built on best practices. Who owns / controls your data? Be sure your organization maintains these rights. 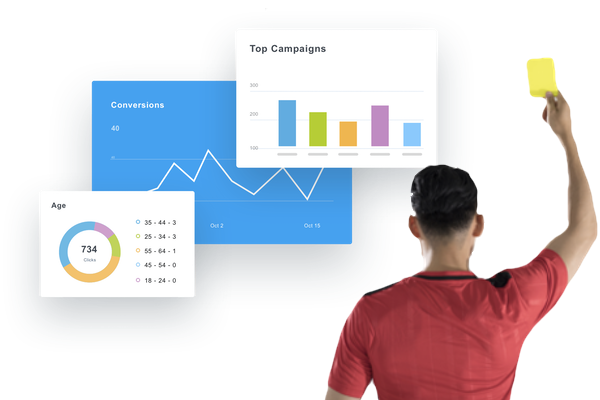 Who’s your Marketing Data Referee? You need independent marketing data reviewed impartially. Do you embrace the scientific method in marketing? Change is constant. Be sure to test, learn, and iterate. If you are determined to maximize your digital marketing ROI by cultivating the best agency-client relationship, please read on. The best agency-client relationships I’ve ever experienced have been a direct result of the marketing team having a clear understanding of digital marketing concepts and execution. They understand the evolution of the digital marketing space, they know why they choose one ad network over another, and they have a good understanding of a marketing and measurement model that can lead to their success. In short, if you have no knowledge of digital marketing, you will not have the ammo to have a productive conversation with your agency nor will you know when to listen or challenge your agency. A good marketing team has a clear idea about their digital marketing campaign scope, objective, timeframe, and expectations. But a great one is able to communicate those expectations and challenge their agency to get those desired results. This helps align the KPIs that are relevant to both parties (agency and business) and prevents an agency from using the top-level KPIs that they’ve used for 90% of their clients. In short, it keeps incentives aligned and results in better execution of your campaigns. More importantly, your agency becomes an extension of your team rather than just an outsourcing partner. Many people believe agencies push back hard when challenged. They think that they are “experts” and should set the agenda, goals, and target KPIs without their client being too involved. In my experience, this is definitively not the case with great agencies. In fact, great agencies welcome client input because it’s only through continuous involvement that you (and the agency) will guarantee that incentives remain aligned and the relationship continues to grow. If, on the other hand, you are working with an agency that resists your feedback or questions, you may well be working with the wrong agency. Before you even consider hiring a digital agency, there are foundational pieces critical to your (and their) success that need to be addressed. Just like you wouldn’t build a house on top of a shaky foundation, your digital marketing strategy will not stand if it’s not set up on solid ground. And the foundation to any digital marketing initiative lies on your ability to setup the data tracking and measurement foundations. 1.Create a UTM parameter library and tracking repository. Trust us, UTMs are the building blocks of all your measurement in digital advertising. A good UTM tracker will utilize consistent naming conventions that will then translate into easily showing you what is working, what is not, and what can be optimized. 2. Set up an online form for your team and agency to use with YOUR “custom” UTM parameters to ensure a level of control. Do not use any Google URL builder, Facebook URL builder, etc that does not restrict how parameters like Source and Medium are written out. NOTE: If you are currently working with an agency and neither you nor your agency have this type of UTM set up, it may be a sign that they’re not really caring about your data so you should revisit your relationship. 3. Evaluate your channel performance in context using your UTM tags. Make sure you’re tracking KPIs across channels from initial ad interaction to web engagement results. (i.e., tracking the customer journey from Facebook link click to Google Analytics bounce rate). I cannot believe we continue to talk about this subject but we continue to encounter teams that are spending thousands of dollars per month in an ad account owned by their agency. We’ve worked with Fortune 5,000 Companies who don’t actually own their accounts. We’ve even met a marketing team recently that had been requesting their agency provide them with administrator access to their paid Facebook analytics for months and still had not received it! How does the agency get away with this! If you don’t have access to your accounts, how can you measure the performance of your agency? Without access to your data, your agency becomes your only source of information. At Factivate, we recently helped a client (big company) who’s agency was reporting CTRs of over 10% for Facebook on a monthly basis. But, when we connected directly to the Facebook data, we discovered that actual CTR was just over 0.8%. Trust me, it happens more than you would think, and it’s bad. If your digital agency owns your account, you’re at risk of your campaigns being run in the same account as their other clients. This SHOULD NEVER happen but I see it frequently because some agencies still benefit from discounted volume purchases. This increases the risk of you being negatively impacted by other advertisers’ bad decisions as well. Furthermore, it guarantees you will NEVER have access to your data because the agency is not allowed to share other clients’ data with you. Should you decide to part ways with your agency, you will loose all of your data. If they don’t agree to hand over ownership of the account, all of your historical performance, your structure, etc is lost forever. 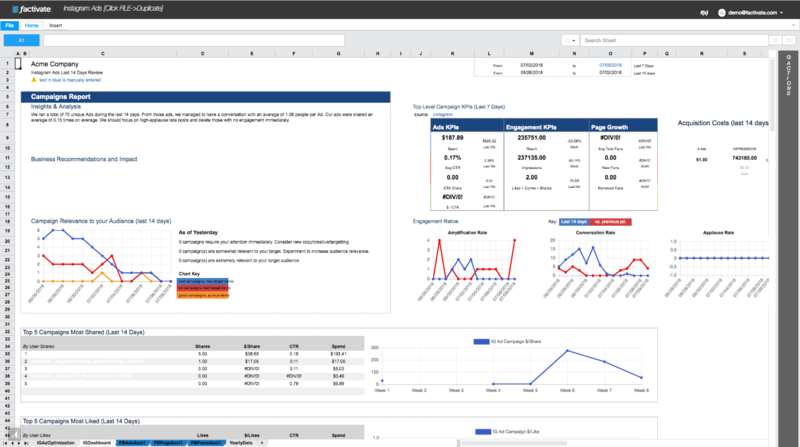 Likewise, if you are using an agency’s proprietary tool or the agency’s dashboard tool, make sure you’ve set up a structure in which you own and have access to your raw data at all times. This person might be known as your internal analytics person, your data scientist, your consultant, or as we call them, “marketing referee”. Their sole purpose is to analyze your data in an impartial manner and help draw conclusions. Too many times have we seen people at an agency, or on a marketing team, skew the data in their favor. We understand why this happens too! As a creative, it’s hard to spend so much energy on a creative campaign and realize that all of that effort may have been wasted. As a marketing strategist, it’s difficult to have to answer to questions about poor spending habits after you’ve blown through your marketing budget you’re your campaigns. And while this can occur internally, it is even more prevalent with bad agencies. Some agencies skew their data to showcase their performance. I’ve even seen some agencies flat out miscalculate KPIs (like ROI), demonstrating numbers that are much higher than the realized ones. This is why you need your marketing referee. The purpose of your marketing referee is not to make life difficult for you or your agency. Instead, you will realize the data transparency point of view they provide will make it infinitely easier for you to reach and even surpass your goals. By emphasizing a neutral perspective on your current and past campaign analysis, you will guarantee a honest and transparent feedback loop that is critical to your success. If you don’t have the budget to hire a full-time marketing analytics expert or data scientist, look to outsourcing it to a third party (not your current agency) for as much support as you can afford. Even if your referee looks at your data once a month, I guarantee you that this impartial check on your team (and your agency) will pay off pretty quickly. It’s very likely that you will also pick up some best practices and learn from your “referee” as you continue executing on your brilliant campaigns. It is not enough for a marketing team to simply add a target growth % from last year’s plan just because you hit your targets. Digital marketing continues to grow and evolve at such an incredible pace that last year’s practices can be seen as ancient. New trends and platforms change constantly and data is looked at in different and interesting ways. The best marketers embrace these changes rather than shy away from them. They’re able to do this because of one simple premise they hold at the core of their teams: embrace the scientific method. By embracing the scientific method, they test different creatives, ad formats, or advertising channels constantly; focusing on lessons learned first and then optimizing the results that work best. While this might take some effort on your part to get here, it pays off with huge dividends once you begin to see improved performances from your test and optimization results. The best marketing teams are always looking for a competitive advantage and recognize that partnering with the right agency will help them get there. While agencies can excel in their respective specialties, this doesn’t mean you can simply let loose, listen to their report once a month, and trust everything will work out in the end. No one knows your business and customers better than you. Embrace the scientific method and challenge them to test, learn, and optimize based on your own perspective of your business. Only when you do this will a great agency/marketing team relationship flourish. 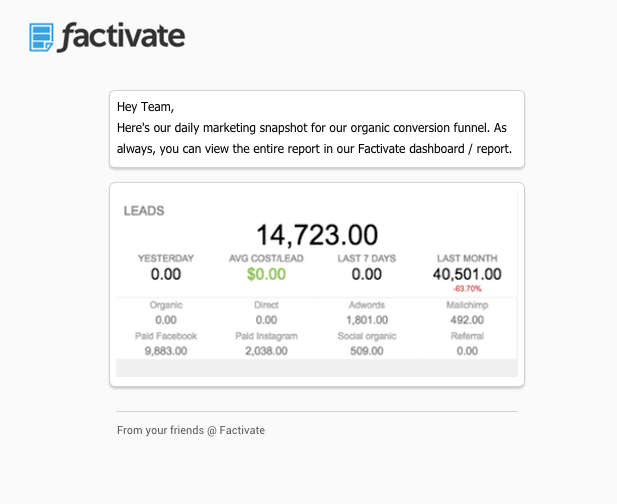 For a full description of these agency monitoring templates, you can download our Ebook here or talk to the Factivate team. Now it’s your turn, do you have any other things you consider internally before you decide to move against your agency? We’d love to hear about it. Tagged under: factivatefactivate analyticsfire digital agencyis my digital agency a problem?marketing analyticsshould I fire my digital agency?Should I fire my marketing agency?top marketing templates to monitor my marketing agencywhy is my agency not performing well?